Step 1. Turn off your computer, go to the park and take a walk. Step 2. Get a pen and a piece of paper and find a quiet place. 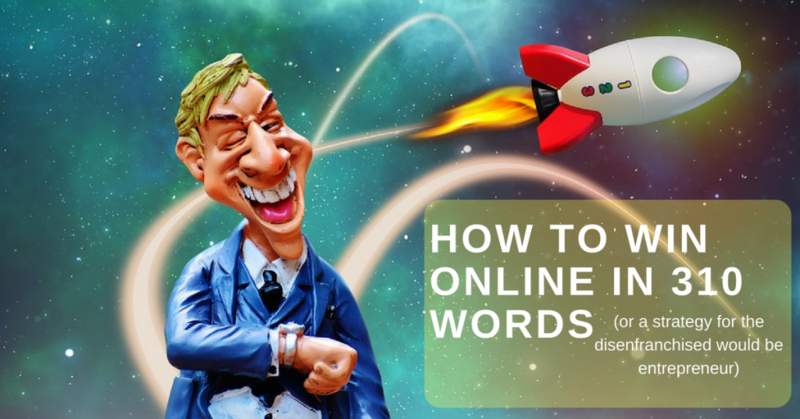 Write down a plan to be successful online. Give yourself 12 months to achieve this. Step 3. Come to terms with the art of not playing it safe. 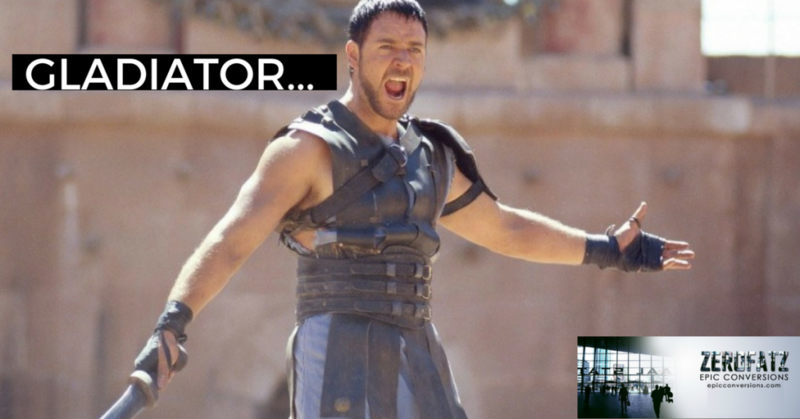 Adopt a strict “beat fear into submission policy.” Accept the worst that could happen for what it is, your fear trying to keep you in a comfortable miserable place. Step 4. Take your 12 month plan and break it into 4 three month quarter plans. Each should move you closer to your 12 month goal. Step 5. Take your 4 quarter plans and break them into monthly, weekly and then daily do lists. Step 6. Execute. The best laid plans are meaningless unless you respect them. Take action on your daily tasks. Get things done. Step 7. Understand that the true key to success is to keep moving forward. Take time to celebrate your victories and to understand your losses but only a day or two. To win here you must keep moving forward. Step 8. Respect your time. Give a dedicated amount of time each day to practical tasks that move your business forward. Your family and friends do not need to understand. They only need to understand that this thing is important to you. Success leaves clues. Some of those clues are scars. Step 8. If you falter, see Step 6. Step 9. If you grow cowardly, and you will know by the extreme uptick of second guessing and hesitation…see Step 3. Step 10. Own every decision, every failure, every success like a boss. Blaming others is for victims. Blame yourself and fix it. 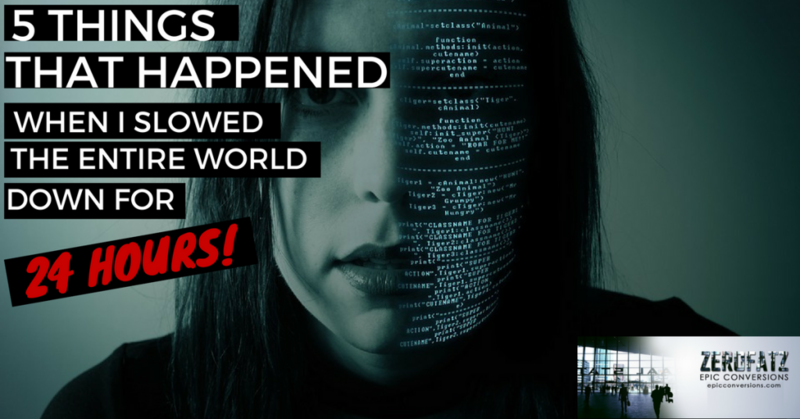 5 Things That Happened When I Slowed the Entire World Down Single-Handedly for 24 Hours! Have you ever painted yourself into a corner? I have. Literally and figuratively. Not long ago I found myself painted into a pretty interesting corner. You see, I make my living on the internet, and that is incredibly liberating because I set my own schedule, call my own shots, and just generally do all the things a boss does. It’s good to be the boss. So good that you might overlook a couple little details. Details like spending more time staring at a computer screen than walking around in the real world. Who ever set out to build an entrepreneurial empire and imagined themselves staring at a screen all day like some mindless robot drone? Not me man. That’s not my idea of a good time. And yet…it was my reality. …then for fun? You guessed it…xbox and netflix with a side of Hulu for good measure. I started doing the math and I realized that I was literally spending more time staring at screens than actually looking at the REAL world. It was kind of terrifying. It’s not just me either. I was reading an article last year that said people are now spending an average of 8 hours and 41 minutes on electronic devices. That’s 20 minutes more than they spend sleeping. Basically we are getting to a place where we are just always connected. …but really he’s the devil and everyone who gets one of those items is F*CKED! Yeah, maybe I watch too many movies but that’s the kind of feel it has to me when you say people are spending more time staring at screens than doing anything in the real world. I wanted to know something. What would I do if I didn’t spend ANY time online staring at screens? How would I spend my day? What would I think about? How would I entertain myself? What would my life look like if I took things back to 1995 for a day? Challenging I know, since the internet is actually my job…but I never backed away from a challenge before. So I decided I would spend 24 hours straight “off the grid” so to speak. One of the first things I did that morning was buy a newspaper because I figured I’d need something to do. What I noticed was that I casually spent the entire day coming back to various parts of the paper and taking in the news. I felt like I was controlling the narrative of my life a little bit more. I wasn’t just being blasted with a steady stream of new content. I picked that paper up and put it down as I went about my day. It was nice and it felt like the world had slowed down. One thing that bugs me about the world today is how fast everything appears to move. News and information zip along at a blindingly fast pace. I truly do not think we as a society even have time to process most of it anymore before we are bombarded with the next thing. I didn’t just skim. I must have bought a newspaper no less than 5 times in the last 5 months and never even got past the front page. This time I was actually enjoying the ritual of reading the newspaper. And when my kids got home I gave them the comics section. It was a good feeling. As the morning turned into the afternoon I was thinking more decisive than normal. Decisions were coming a little easier. Things didn’t seem quite so jumbled. I saw an ad that took up a whole page that was done like it was supposed to be an article. It was cool because it was a hero’s journey style sales copy. It had pictures and testimonials and the pitch was at the bottom. It made me smile because it was well done and I thought it was cool. It was the most positive thing in that whole paper. The only positives in that whole paper was the sales copy of ads. What do you think the meaning of that is? I don’t think I would have had the focus to mess with it or even notice it in my normal life. Let alone fathom what it meant. As my focus improved I started remembering things that I wanted to get done that had been put off for months because I just felt there wasn’t enough time. The internet makes you feel that way. …I finally started reading it. I had felt like I just didn’t have the time. That book had sat right next to my tablet for months which I always had time to pick up every single night. I read 150 pages of that 256 page book. It has been a long time since I read that much of any one thing. A renewed sense of focus I guess you could say. The book was absolutely fantastic and eye opening. I noticed that when I slowed the world down, ideas started coming to me. 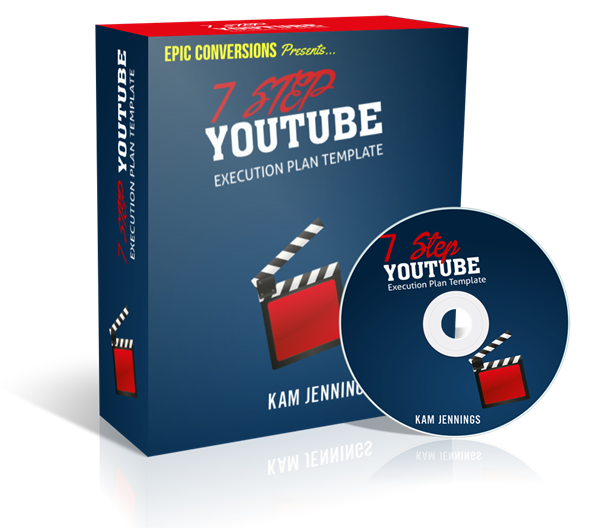 Ideas for products, for blog posts, for youtube videos. I started the day with a blank composition notebook for any ideas that might come to me. In the morning I remember staring at it with a pen and just thinking…God…I have nothing to say. So I gave up and started reading the paper. As the day went on though I started coming back to that little composition notebook and sketching out concepts for products. Notes for blog posts. Even ideas I had for songs. I’m a musician but I haven’t written any new songs for years now or even played my guitar for months. It felt like as I disconnected from “devices” I began to reconnect to self. There is good in the world, there is bad in the world, and then there is balance. I do not think the internet is a bad thing. I like the internet. It changed my life for the better. But I think that sometimes something so interesting comes along that if you are not careful you can get lost inside it. The idea of having the world’s knowledge at your fingertips is one such thing. I’m not interested in becoming a monster and I’m not interested in the abyss staring back into my soul. I will take 24 hours off every week from now on to reconnect with reality a little bit. I think it’s important. How has the internet changed the way you live your life? What the hell did Friedrich W. Nietzsche mean when he started talking about monsters and abysses? That’s all I got! See you in the next one! As I write this, I am listening to the Dandy Warhols play Bohemian Like You. Are you familiar? Better go put it on if you’re going to read this. 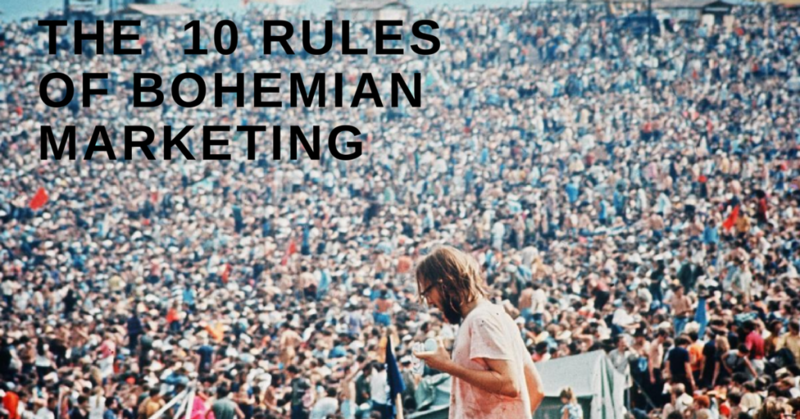 Bohemian – a person who has informal and unconventional social habits, especially an artist or writer. It’s a product about creating and selling digital assets. 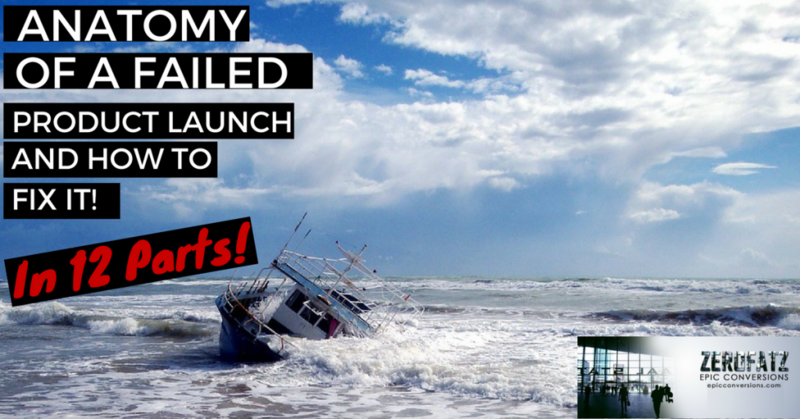 I launched it for 4 days. That “White Trash” thing got a lot of people talking. Some good, some bad, but a lot of energy. And when the dust settled 4 days later Cloud Money, my funny little course with the politically incorrect name had generated $10,426.67. I’ve got a legit surprise for you. it’s called the DualSqueeze funnel strategy. But this isn’t just ANY funnel. That’s all I got! ENjoy the easy list building! 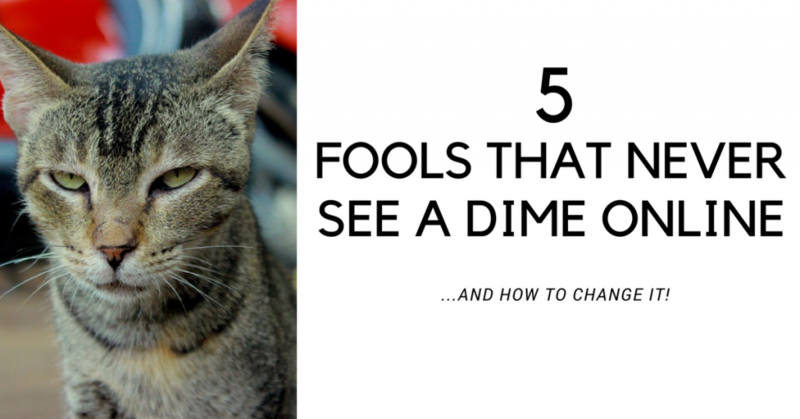 5 Fools That Will Never See A Dime Online…And How to Change It! 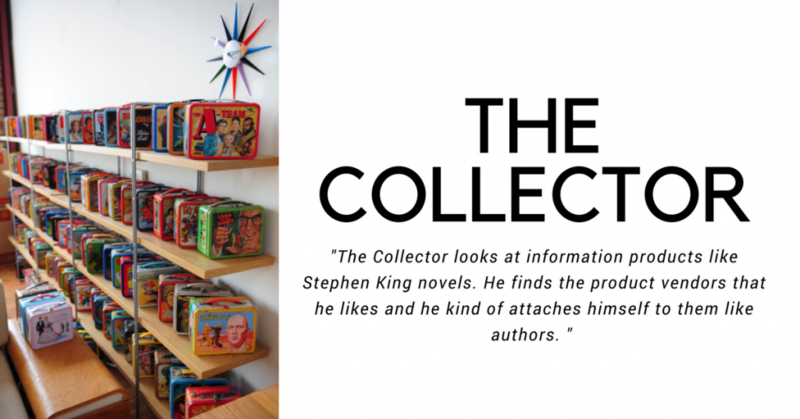 The Collector looks at information products like Stephen King novels. He finds the product vendors that he likes and he kind of attaches himself to them like authors. When they release a new product he buys it. When they send out a new email he opens it. He collects their products, never really taking action on any of them but just being entertained by them. Many times the collector doesn’t even realize he’s a collector. Many times it’s a subconscious act. He thinks he’s being productive by following the teachings of his most favorite internet marketing gurus, but in reality he’s just being entertained by them. Many times the collector understands that he is not making money because he is not taking action. He has a sense for it but doesn’t have the urgency to change it in most cases. I don’t mind the collector. If severe ambition and a penchant for execution did not haunt me, I myself might be a collector. My grandfather was a collector of coins, guitars, and even cars.